From Lovecraft’s Cthulhu Mythos to Disney’s Ursula and Nintendo’s Splatoon, squid and their squad continue to captivate people throughout the ages. They’re survivors, both in nature and in human consciousness. 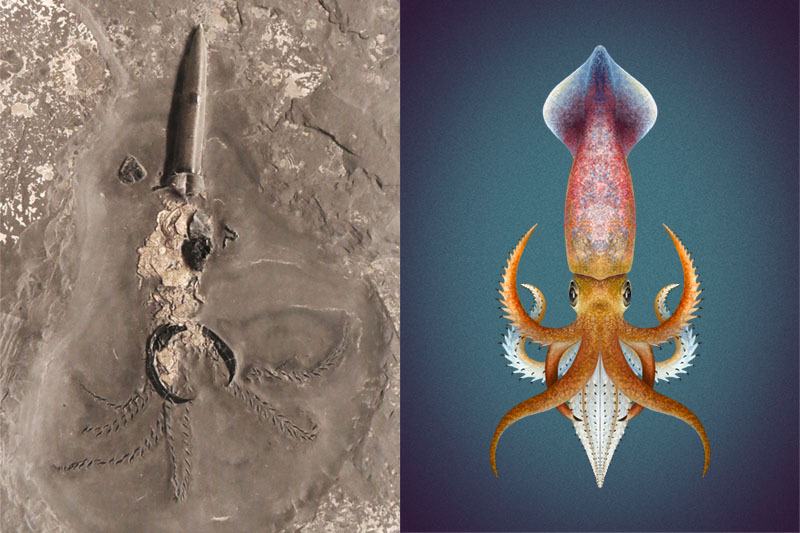 Over the course of 500 million years of their history, cephalopods have left us plenty of traces of their presence. They may be no krakens, but many of them have spawned stories on their own. Squids’ long-lost relatives, the ammonites, are commonly found in many parts of the world. Their spiral shells have been thought to be the remains of petrified snakes in England, a symbol of the God Vishnu in India, and charms to bring good luck in Buffalo-hunting by the Blackfoot and other indigenous peoples of North America. It’s no surprise people thought of ammonites as anything but a “squid” in a shell. Together with their close relatives the snails and clams, cephalopods like squid, octopus, and ammonites are collectively known as mollusks. The name comes from the Latin word for “soft,” a nod to their squishy, moisture-filled bodies that don’t usually fossilize. In the scientific community, it was a British polymath named Robert Hooke who first got pretty close to the truth. He lived in a time when fossils were thought to be oddities in nature that grew in rocks instead of the remains of living beings. After European explorers brought back nautilus specimens from Indo-Pacific waters, he compared the spiral shells of ammonites with them in 1665. He suggested that the shells must have belonged to nautilus-like creatures that no longer exist on Earth. This idea was met with resistance from other naturalists of that time, who rejected the notion that many creatures on this planet must have gone extinct by means of large-scale disasters. A selection of fossil cephalopods. Image by Franz Anthony. Scattered all across Europe from Scotland to Russia are peculiar bullet-shaped stones called belemnites, from the Greek word for dart. For centuries, they were believed to spawn after a heavy rain — remnants of thunderbolts that turned into stone as they hit the ground. Then in 1724, the German paleontologist Balthasar Ehrhart suspected that belemnites might be cephalopods. Unlike ammonites, which could be easily compared with the living nautilus, there’s no living equivalent to belemnites. At the time, it was difficult to imagine what belemnites would've looked like in life. The revelation came in the early 1800s when the finger-like fossils were discovered with clear traces of soft tissues around them. Belemnites, as it turns out, were squid-like creatures. The fossils that people have unearthed for centuries turned out to be the animal’s internal structure called rostrum, similar to how squids today have a “pen” inside their body. 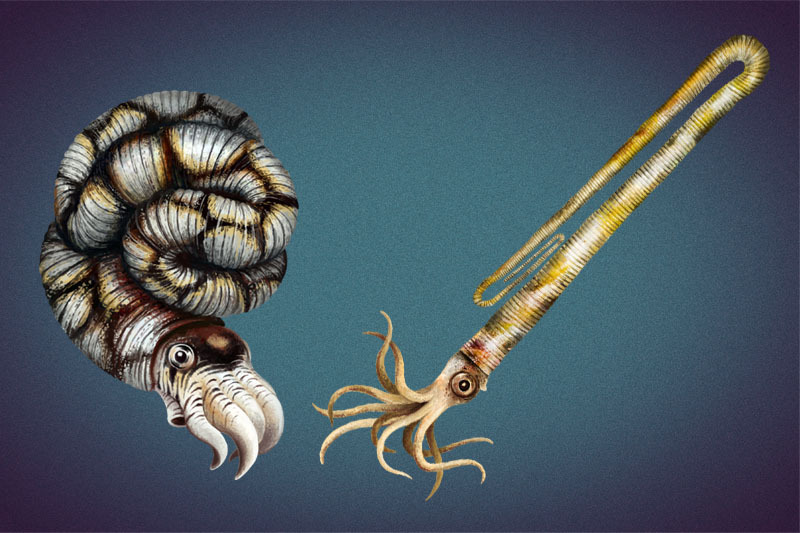 Belemnites, however, had ten arms of equal length while modern day squids modified a pair into specialized tentacles. A belemnite genus called Passaloteuthis even had a pair of jumbo-sized hooks called megaonychites that seem to sprout out from the base of its arms, but nobody knows yet how they were attached in life. When deep-sea expeditions became more and more common in the 19th and 20th century, it was among their mission to find “living fossils” that might be hiding from humans. They eventually failed to turn up living belemnites and ammonites, strengthening the idea that large-scale extinctions must have happened at some point in history. My, Passaloteuthis, what big hooks you've got. Fossil photograph taken at Museum am Lowentor, Stuttgart by Ghedoghedo, reconstruction by Franz Anthony. It wasn’t until 1896 that people learned about the first fossil octopus, which was discovered in Lebanon. The fossil, named Palaeoctopus, showed a small creature with eight arms of equal length and fins like many deep sea octopuses today. Unlike the belemnites and their hard internal structure, the delicate octopuses left very little trace in the fossil record. Even today, not much is known about the history of ancient octopuses: how they lived, evolved, and died. But a small, lesser-known housemate of SUE the T. rex at the Field Museum, Chicago might offer a clue. The 296 million-years-old fossil named Pohlsepia is an oddity. Prior to its discovery, the oldest known octopus, Proteroctopus, is at least 140 million years younger. But Pohlsepia appears to be very octopus-like and must have had its own ancestors that stretched further back in time. If Pohlsepia turns out to be a real octopus, then the first octopus might have already existed when fishes started crawling on dry land in the Devonian Period. At this point, Pohlsepia is one of a kind. There’s only so much we can learn from a single fossil and we need discoveries of more fossils to solve their mystery. Pohlsepia, SUE the T. rex's lesser known housemate. Fossil photograph and interpretative drawing ©Joanne Kluessendorf and Peter Doyle/Palaeontology, reconstruction by Franz Anthony. Although Pohlsepia’s body has survived eons under the ground, not many others have been so lucky. 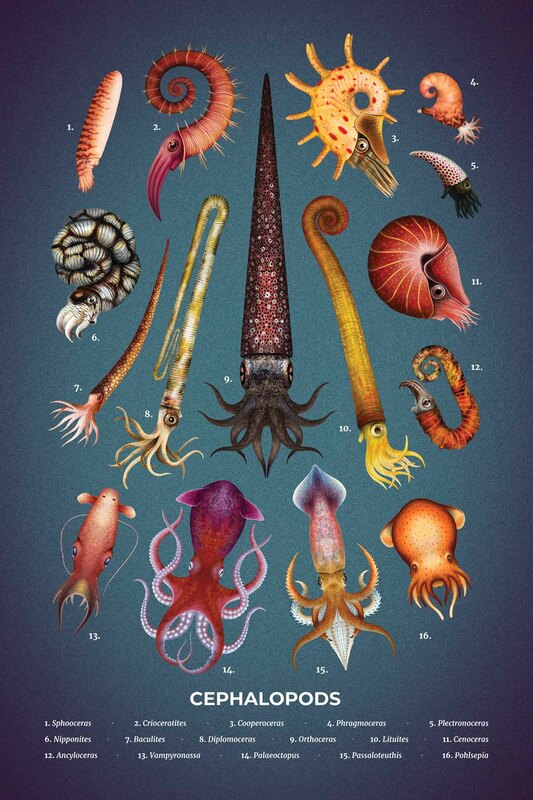 Despite their abundance in the oceans today, not a single fossil squid has ever been found. This question intrigued researcher Thomas Clements, whose study involved watching squishy squids and octopuses rot for weeks to figure out why some cephalopods dissolve more quickly than others. Normally, fossilization happens when a creature’s soft tissue is replaced by minerals such as calcium phosphate. This mineral needs acidic conditions to form, but the ammonia from the squid’s tissue makes the carcass too alkaline, preventing mineral replacement. But why would a squid carry ammonia in its body? Apparently, ammonia is what keeps them buoyant. While shelled cephalopods like nautiluses can trap air inside their shells, squid and octopus had to employ a different trick when evolution got rid of their external case. Because squids tend to swim constantly, they have more ammonia in their bodies than octopuses, which tend to stick close to the ocean floor. In addition, a squid’s more slender body and arms also speed up decomposition. This further reduces the chance of a squid being rapidly buried for fossilization after death, which is pretty slim for a sea-going creature in the first place. Most ammonites are spiral-shaped while a few sport helix shells. Unusual-shaped ammonites like Nipponites (left) and Diplomoceras (right) are outliers and shouldn't be counted as the norm. Image by Franz Anthony. The same issue also happens to plague the ammonites. After more three hundred million years reigning until the Age of the Dinosaurs ended, very little is left of their softer bits. Even in fossil sites with exceptionally good preservations, we see next to nothing beyond their empty shells. However, a CT-scan study published by Isabella Kruta and colleagues in 2011 revealed exciting internal features. Prior to this study, such minute details could only be seen when a fossil is extracted in a very specific way, which is tricky considering how brittle they could be. Her closer inspection has revealed that ammonites had tiny teeth on their tongue-like radula that more closely resemble modern day octopuses than nautiluses. In a strange twist, ammonites were more closely related to and probably resembled a squid or octopus more than the shelled nautilus they were first compared with. This means ammonites were more likely to have had ten arms of equal length instead of nautilus-style dozens of tentacles. Another notable characteristic of the ammonites is their ability to breed fast and die young. This led to a very quick rate of evolution, allowing them to diversify beyond the iconic shape we’re familiar with. Some of them were straight, while others looked like a tangled ball of yarn or the sentient paperclip from Microsoft Office 1997. Ammonites have also helped geologists identify the age of rock layers. Their widespread distribution allows for cross-checking with other fossil sites, while their rapid evolution means specific physical features can point to narrow time frames instead of “the entire 56 million years of the Jurassic Period.” Essentially, paleontologists are now able to navigate through time after consulting these omnipresent spiral-shaped fossils. Slow and steady wins the race. Nautilus' relatives didn't diversify as much, but their slow lifestyle helped them wait out catastrophic years. Image by Franz Anthony. But this is also the cause of their demise. Breeding fast and dying young means that in the face of catastrophes, an entire generation could fail to spawn and the species heads straight to extinction. Throughout their history, ammonites narrowly escaped multiple mass extinctions. The few species that survived each one recovered quickly afterward, but their fast-paced life stayed the same. Finally, it was the End-Cretaceous mass extinction that finally got them for good. Meanwhile, the ancestors of the nautilus were spared thanks to their slower pace of life. It allowed them to survive extinctions by waiting out less-than-ideal conditions for a few years. 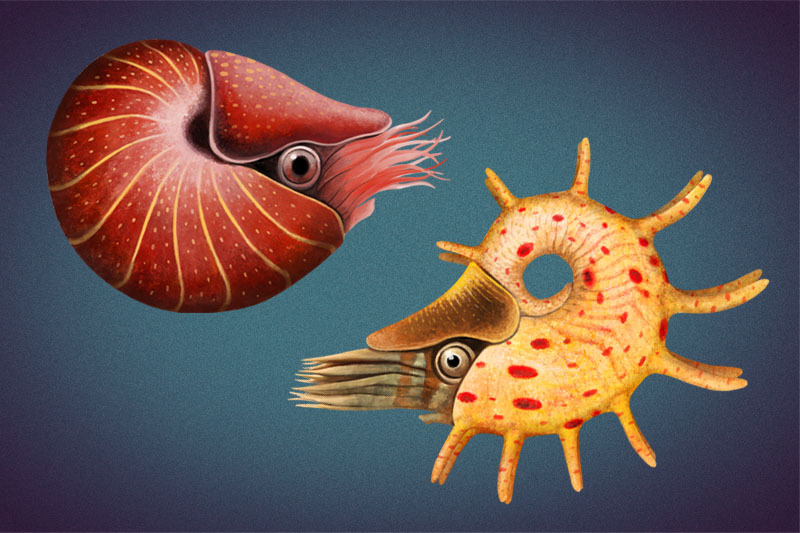 This also explains why the nautilus and its ancestors, collectively called nautilids, have been slower in experimenting with their looks compared to the ammonites. It’s also worth noting that the nautilus has a strikingly unique anatomy. Unlike the squid and octopus, the nautilus sports dozens of sucker-less tentacles, a leathery hood, a pinhole eye, and lacks an ink sac. Given the long history of their lineage, these features were once thought to reflect what early cephalopods looked like in life. But studies of nautilus embryos suggest otherwise. Though our tailbone is no more than a stub, we humans start out in the womb with a visible tail, a reminder of our ancestry. Nautilus embryos too, reveal that their ancestor likely had ten arms before splitting into dozens of tentacles somewhere in the evolutionary line. Their iconic hood also seems to be fused, highly modified tentacles, meaning it’s a very specific feature that only appears in the many-limbed nautilids and not in other cephalopod groups. 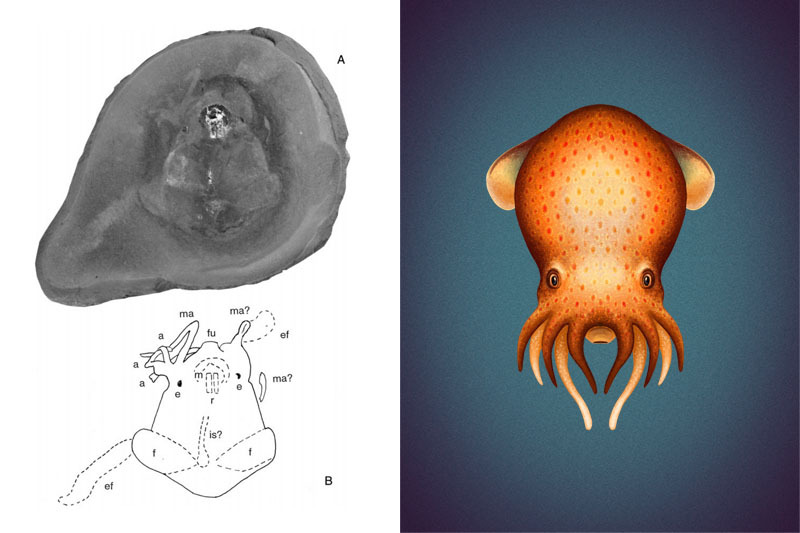 Enigmatic soft tissues aside, what did the earliest cephalopods look like? The earliest forms of cephalopods would look unfamiliar to today's viewers. 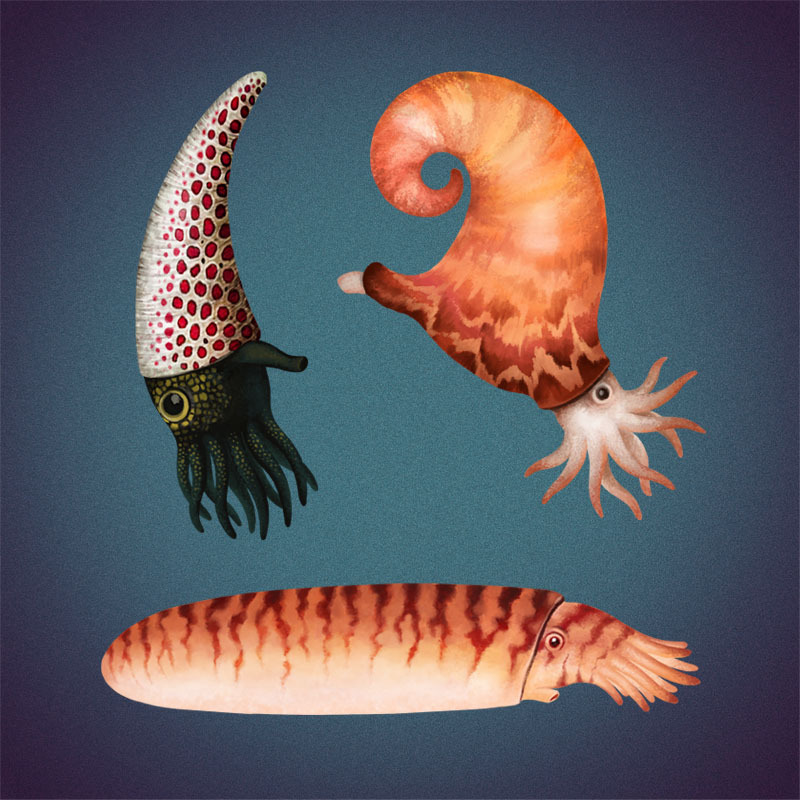 Top left: Plectronoceras, top right: Phragmoceras, bottom: Sphooceras. Image by Franz Anthony. Unlikely as it may be, there have been some ancestral cephalopod shell fossils discovered largely intact, even with traces of coloration and growth stages. Take Sphooceras, for example. Shelled cephalopods are born small, then they keep adding new material to renovate a bigger house while keeping their baby crib intact. Multiple Sphooceras fossils found to represent different stages of its life suggest that in adulthood, Sphooceras actually lost its baby coils. The smoothness of its shell resembles that of today’s cowrie shells, which sometimes can extend the soft parts of their body to cover the entire shell to polish it. Some paleontologists think Sphooceras’ mantle might have polished its shell in the same way, breaking down the baby shells and patching up the holes as it grew up. Interestingly, for a shell that’s over 410 million years old, some of its fossils preserve traces of coloration. It’s been suggested that they had stripes similar to today’s nautilus, which help to disguise them from predators. Another fascinating early cephalopod to talk about is Phragmoceras, which is about the same age as Sphooceras. There are multiple forms known to science, some had striped patterns while others had zigzags near the opening side of the shell. It suggests that they were probably a group of adaptable animals that disguised themselves with different patterns depending on which part of the water they lived in. Unfortunately, not much is known about the earliest cephalopod. There are multiple fossil specimens named Plectronoceras, estimated to be 501 million years old, but none of them are complete. Despite this, its shape matches the estimated ancestor of all cephalopods, with an air-filled chambered shell that looks like a gnome hat. This kind of modification helped cephalopods stay buoyant and not tied to the ocean floor. Such a new lifestyle set them apart from their close relatives, the snails. Our search for the ancient cephalopods is far from over. Somewhere out there, there are more fossils waiting to be discovered, each one having their own story to tell. But even with our limited knowledge, we can already see that our squishy cohabitants are the protagonists in their own narrative. They’re more than just prey for the marine reptiles of the ancient Earth, no matter how delicious we think they are. Special thanks are owed to Thomas Clements, Mark Carnall, and Kenneth De Baets for their help on this article. Danna Staaf's book Squid Empire: The Rise and Fall of the Cephalopods and her insight have brought forth the latest developments in cephalopod paleontology that are otherwise difficult to track down. Danna Staaf. 2017. Squid Empire: The Rise and Fall of the Cephalopods. ForeEdge. Isabelle Kruta, Isabelle Rouget, Sylvain Charbonnier, Jérémie Bardin, Vincent Fernandez, Damien Germain, Arnaud Brayard, Neil Landman. 2016. Proteroctopus ribeti in coleoid evolution. Paleontology. 59, 6, pp 767–773. Isabelle Kruta, Neil Landman, Isabelle Rouget, Fabrizio Cecca, Paul Tafforeau. 2011. The Role of Ammonites in the Mesozoic Marine Food Web Revealed by Jaw Preservation. Science. Vol. 331, Issue 6013, pp. 70-72. Joanne Kluessendorf, Peter Doyle. 2000 Pohlsepia mazonensis, an early "Octopus" from the Carboniferous of Illinois, USA. Palaeontology 43(5): 919-926. Mark Carnall. 2016. I, for one, welcome our new cephalopod overlords... but what are they? The Guardian. Accessed 15 February 2018. Mark Carnall. 2017. The ancient mystery of St Hilda's 'snake stones': what do ammonites really look like? The Guardian. Accessed 15 February 2018. Phil Eyden. 2004 (2010) Fossil Octopuses. The Octopus News Magazine Online. Accessed 15 February 2018. Phil Eyden. 2013. Myths and Legends. The Octopus News Magazine Online. Accessed 15 February 2018. Shuichi Shigeno, Sasaki Takenori, Sigurd von Boletzky. 2008. The origins of cephalopod body plans: A geometrical and developmental basis for the evolution of vertebrate-like organ systems. Cephalopods - Present and Past. Tokai University Press, Tokyo, p. 23-34. Thomas Clements, Caitlin Colleary, Kenneth De Baets, Jakob Vinther. 2016. Buoyancy mechanisms limit preservation of coleoid cephalopod soft tissues in Mesozoic Lagerstätten. Palaeontology, 60, 1, p.1–14. Walter Etter. 2015. Early ideas about fossil cephalopods. Swiss Journal of Palaeontology. 134, 2, pp 177–186.